With five essential gardening tools, you can cultivate surroundings that inspire beauty, serenity, and a newfound appreciation for mother nature. OCALiving is a company that - much like anything great - started as a seed of an idea. Founder Bernie Crayford had a desire to make high-end gardening accessories that were reminiscent of her childhood and encouraged others to pursue the art of horticulture. With the proper tools, you can create anything you set your heart to - and Bernie made that possible with this 5 piece planter starter kit. 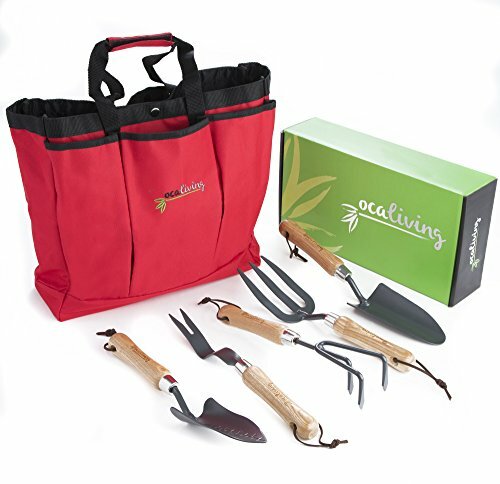 The OCAliving garden hand tools set comes complete with a 3-pronged fork, a trowel, a cultivator, a transplanter, and a weeder. Comprised of powder coated carbon steel and firm-grip, wood ash handles, this gardening equipment makes planting, digging, weeding, and transplanting simple. Accessorized with a cherry-red polyester bag with 6 exterior pockets, this collection is perfect for gardening enthusiasts. Every piece of this garden maintenance kit is durable, weather-resistant, UV-resistant, and built for longevity. Complete with an attractive green gift box, this makes for the perfect gift set for women or men. PREMIUM CRAFTSMANSHIP: Planting, potting, weeding, digging, and growing can be pretty strenuous, which means you need reliable, heavy duty gardening tools that can meet the challenges that come with horticulture. Designed with powder coated carbon steel and ash wooden handles, these planting hand tools will last for years. Each piece comes with leather straps to hang your accessories to dry or for convenient storage. LUXURIOUS, ERGONOMIC DESIGN: The OCALiving yard maintenance kit is the perfect blend of functionality and sophistication. Each tool boasts stunning curves and timeless beauty. The contrast between the gunmetal grey steel and the textured, patterned handles creates an unrivaled elegance. Even the head of the trowel has a convenient measurement chart! Accented with leather hanging straps and our name etched on each piece, this garden utility set will be a cherished collection. OPTIMAL STORING CONDITIONS: To help maintain the efficacy and integrity of our five-piece planting tool kit, we provide a bright red gardening tote with six external pockets for storage. It's lined with reinforced-stitched handles and a snap, center closing. Made of 600D polyester, this handsome bag is resistant to tearing, UV rays, and adverse weather. Brightly colored so you can see it easily, it will hold all of your hand tools and other planting accessories and supplies. THE PERFECT GIFT SET : The OCALiving essential gardening maintenance kit is an ideal present for men, women, gardeners, grandparents, homeowners, horticulture enthusiasts, or anyone with a green thumb. Packaged beautifully, these gardening tool gifts are a great option for Mother's Day, Father's Day, Christmas, birthdays, anniversaries, weddings, or housewarming parties. Our cultivator hand tool collection will be loved and appreciated for years to come. If you have any questions about this product by OCALiving, contact us by completing and submitting the form below. If you are looking for a specif part number, please include it with your message.